Mysimba is a medicine used by people with a BMI of over 30 to help them lose weight. You can calculate your BMI using an online calculator and inputting your weight, height and age. A healthy BMI is 18-25, and a BMI of 30 or over is classed as medically obese. Obesity can lead to potentially fatal conditions such as high cholesterol, high blood pressure, heart attack or stroke. It can also impede on your ability to lead a full and active life. Mysimba helps you to lose weight when lifestyles changes alone, such as a healthy diet and a programme of increased exercise, have not helped sufficiently. If you need to take Mysimba tablets, you can buy them online safely from a UK doctor such as Doctor-4-U by completing our simple medical questionnaire and getting a certified prescription. It will be dispatched within 24 hours. Do you suffer from seizure disorder, have a history of seizures or been diagnosed with a CNS tumour? Have you ever suffered from suicidal ideation or history of attempted suicide? Mysimba is type of weight loss aid medication taken by people with a BMI of 30 or more in order to assist them in losing weight more than lifestyle changes alone would. Mysimba should only be taken under your doctor’s recommendations, and when lifestyle changes have not worked. The dosage will gradually be increased over several weeks as you are on the medication. You need a prescription from a GMC/EU certified doctor in order to buy this medication online. To buy Mysimba from Doctor-4-U, simply complete our online consultation and if you are deemed suitable, we will dispatch your medication usually within 24 hours. If you are not deemed suitable for Mysimba, you will receive a full refund. Do you need a prescription for Mysimba? Yes, you need a prescription from a GMC/EU certified doctor in order to buy Mysimba online. With Doctor-4-U’s easy consultation process, you can get a prescription for Mysimba safely and quickly. Select the item you want to buy, click “Start Consultation” and fill out the short medical questionnaire provided. If you are deemed suitable for your prescription, it will usually be dispatched within 24 hours. If not, you will receive a full refund. 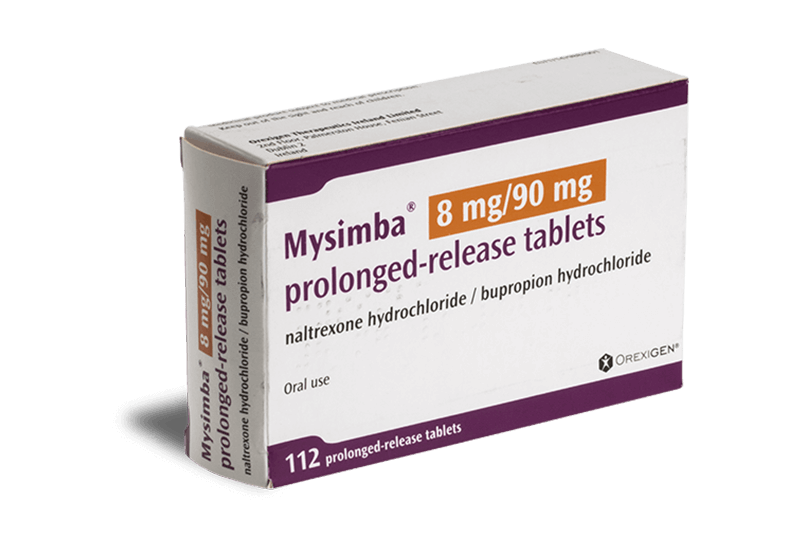 Mysimba contains two active ingredients, naltrexone hydrochloride and bupropion hydrochloride. Although the exact way in which Mysimba works is not known, it is believed that these ingredients work together to change how you feel about food and appetite, and take some of pleasure from eating. Although Mysimba is designed for those who have a BMI of over 30, your medical history and other medications may mean it isn’t right for you. Swallow the tablets whole with food.